Cyclone's soundbank is absolutely superb, and the interface provides more than enough flexibility to make it a long-term keeper. It's also immense fun to play and very keenly priced. Fun, flexible and sounds superb. Well priced. Triggers feature a little gimmicky. Known for its big cinematic ROMplers, Sample Logic's latest scripted Kontakt library is a 2.6GB collection of decidedly electronic drums, pads, leads, basses and more. Around 325 single instruments and multis are included. 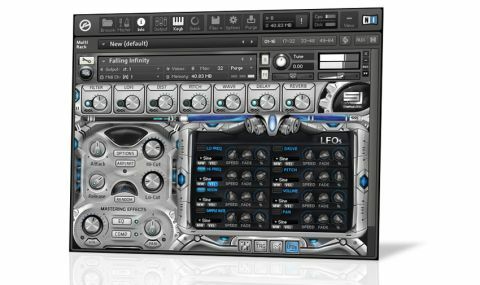 The interface is one of the more ambitious we've seen in a Kontakt instrument - perhaps a little overwrought, even, with its metallic sci-fi styling - but it's relatively easy to get on top of in functional terms. "The Wave section enables you to mix conventional subtractive synth waveforms in with the loaded samples"
One of the big selling points is the Wave section (hosted within the effects rack, puzzlingly), which enables you to mix conventional subtractive synth waveforms (pulse, triangle, saw, etc) in with the loaded samples. Three separate level controls set the volume of the wave in the low, medium and high registers, and the balance between it and the sampled content is set in the main mixer page. It's a great idea and it works really well, greatly expanding the sonic potential of the Cyclone library across the board. Similarly powerful is the LFO section, which hosts eight of the things, hardwired to control a well thought-out set of parameters; and the Multi Script Macros, for multi- target Macro knob assignment within multis. Cyclone boasts not only a regular Arpeggiator/ Articulator (the latter for applying +/- step sequenced velocity offset) but also the Arpeggigater - a step sequencer for the effects bypass buttons, for choppy, glitch-style madness. While we're on the subject of the effects, Cyclone's eight modules comprise Filter, Lo Fi, Distortion, Pitch, Delay, Reverb, EQ and Compressor, all fully editable and sounding great. The Triggers feature gives you eight preset sets of six push-button effects chains, for applying momentary or longer-term processing. Being entirely preset-based, this particular feature feels a bit gimmicky - which isn't to say, though, that it can't be useful for making radical changes to a patch in a few clicks.